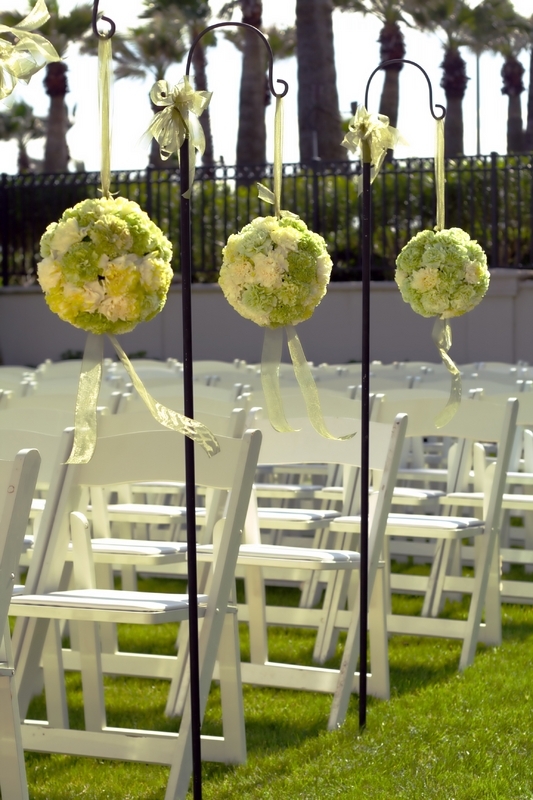 A floral pomander (sometimes called kissing ball) is a great DIY project that can be used for a variety of things in your wedding! 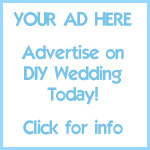 It is wonderful for bouquets, decor and centerpieces. You may ask, what is a pomander? Simply put, it is a foam ball covered in flowers (either fresh or silk will do!) 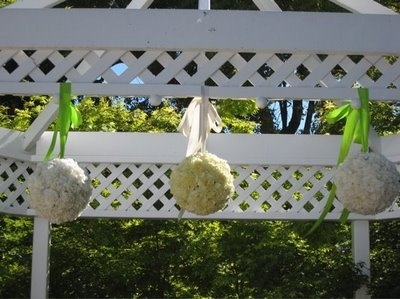 to create a ruffly floral ball. A ribbon can be attached to use it as a bouquet or hang up as decor. You can also prop it onto a pretty vase and use it as a centerpiece. 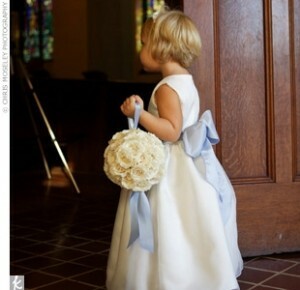 If fresh flowers are being used, a sturdy flower such as daisies, carnations, mums, roses or dahlias work best. If you plan on using silk go with whatever flowers tickles your fancy! Keep in mind fresh flowers would need to be created as close to your wedding day as possible, while silk flowers last forever and can be created as soon as you like! If you are using fresh flowers you will also need some flower food/preservative. Let’s begin! If using fresh flowers you will first need to condition the flowers to allow them to last as long as possible once in the foam ball. Clean a larger bucket and fill it about 1/4 full with warm water and flower food (at ratio explained in flower food instructions). Remove all lower leaves from your flowers and cut stems at a sharp angle to allow for maximum water absorption. Allow flowers to sit in the water at least 10-15 minutes. Next, if using fresh flowers you will also need to gently soak your oasis foam ball. Place the sponge/ball in warm water with flower food dissolved in it. Allow the ball to submerge itself. Avoid pushing the sponge down into the water as it can cause bubbles within the ball. 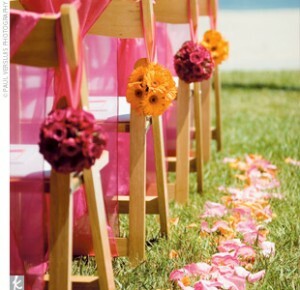 These are air pockets that wouldn’t allow your flowers to drink! Now you’re ready to start assembling! Remove your flowers from the bucket you were conditioning them in and cut stems at a sharp angle to about 1″-1.5″. Starting from the top, push the stem of your first flower into the foam ball, making sure it is pushed firmly(but gently!!) into the foam base. Continue in a straight line until you have created a ring all the way around your ball. Then, make a line halfway around, and fill in the quarters. If you feel your flowers aren’t secure enough, you can pin them in with greening or boutonniere pins. 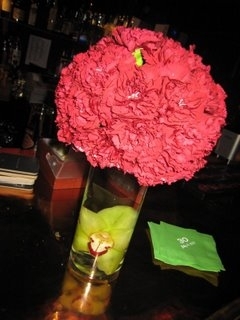 If you plan on using your ball as a centerpiece resting on a bowl or vase, you’re done! 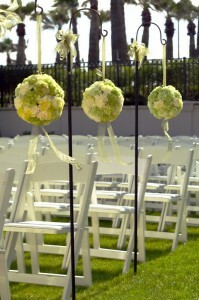 If you plan on hanging the ball for decor or using it as a bouquet, you will need to attach some ribbon or jute. 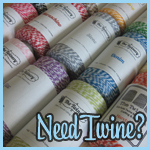 Measure desired length x 2 and add 3 inches for the knot. Tie into a loop (double knot). Hold in place with greening pin. You can then add some hot glue and another greening pin over the top for an extra secure hold. If making a hanging pomander, an additional detail you may like is attaching a corded tassle to the bottom of your ball, for a pretty dangly effect. To do this, attach the corded tassle loop to a wired pick. Dip the pick’s unwired end into floral adhesive and press the pick into your pomander. 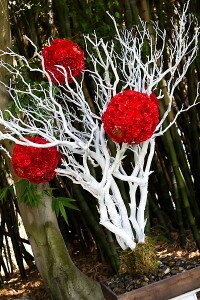 Here is a fantastic video I found, creating a floral pomander with carnations. It is such a beautiful finished look! 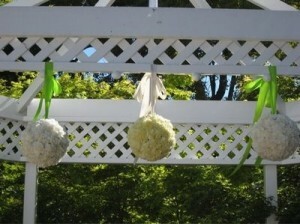 I am thinking of trying to find some tinted blue and green carnations to make some hanging pomanders for my big day. Please send me your photos if you make some diy pomanders using my instructions!